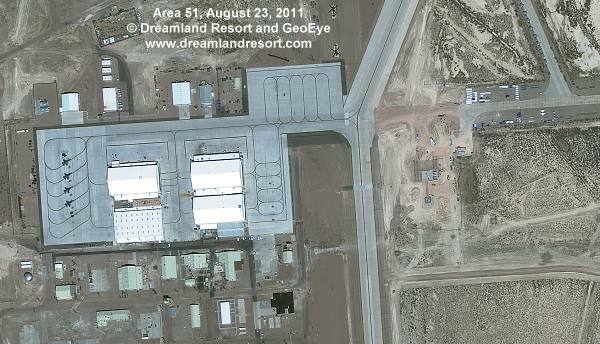 Below are some clips from our new 2011 Area 51 Satellite image, taken by the GeoEye-1 satellite on Tuesday, August 23, 2011 at 11:23am PDT. 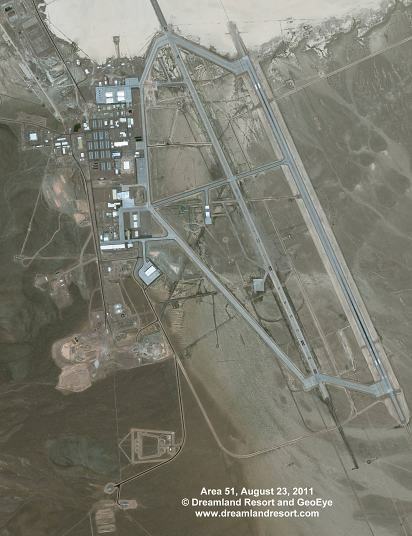 The resolution of the original image is 0.5 meter, making it the highest resolution and most up-to-date satellite image of Area 51 ever published. There is evidence of two major new construction projects just getting under way, one major construction project and a couple of smaller ones being wrapped up and major road improvements. 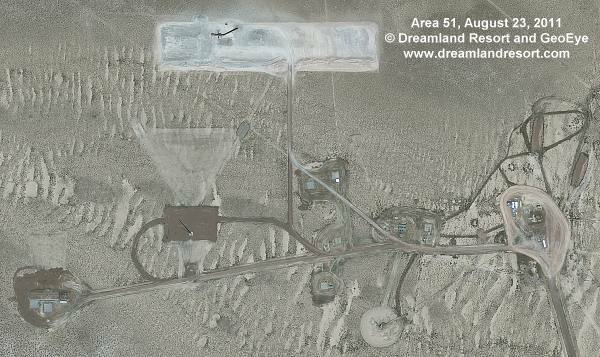 It certainly looks like Area 51 is busier than ever, and getting ready for new black projects which, although we are curious, we agree must be kept secret to ensure the safety of our country. The individual clips show significant changes since our 2009 Satellite Image. Click in the preview images for a full 0.5 meter resolution version of the clip. Some of the clips are quite large. You may need to disable automatic image resizing in your browser settings. This is a Dreamland Resort Exclusive! This new satellite image was taken upon our request, and paid for with donations from our readers. All photos are © 2011 Dreamland Resort and GeoEye. Publication of this material outside of the Dreamland Resort web site is strictly prohibited. Overview of the entire main base area. Click in the preview above for a 2 meter high-resolution version. There is some very interesting construction at the north end of the base, just east of the North Ramp. It looks like the construction of yet another new hangar in its very early stages. It is interesting to note that this new hangar would be the first hangar east of the old U-2 runway, which now serves as taxi way. 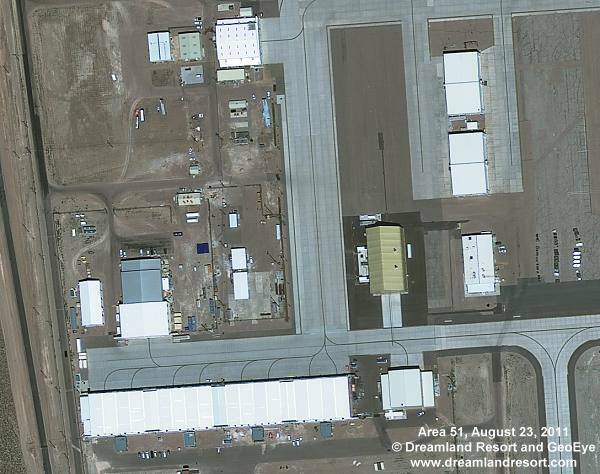 The size and distinct shape of the foundation of the new hangar looks very similar to two existing hangars at Nellis AFB, near the north end of the base. The hangars at Nellis are used for the security helicopters. With the Groom helicopter ramp being just north-west of the new construction (two helicopters can be seen in this frame) it is very likely that this hangar will also be used for the PaveHawk security helicopters. The clip also shows four F-16 on the North Ramp. Finally, one of the buildings belonging to the block of the original U-2 hangars, the one in the north-west corner, has been slightly extended to the north. The U-2 hangars all have light green colored roofs. The extension has a white roof. 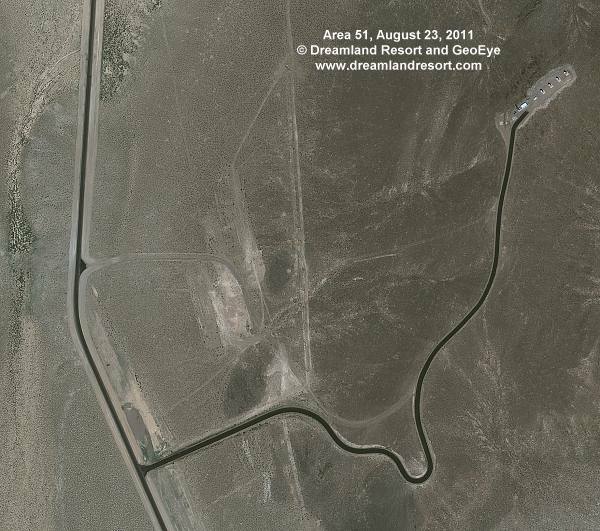 This remote site just north of the road from Area 51 to Gate 700 to the NTS was expanded around 2006. Not much is known about the purpose of the site. It may be a specialized RCS test site, or otherwise used for radio tests. There was not much evidence of activity here for a while, but our new satellite photo shows lots of fresh tracks at the eastern cell of this complex. There is also a newly developed area north of the existing site that appears to be a gravel pit. There are fresh tracks from the gravel pit to the cell in the east, but no further tracks on the only access road. The gravel pit appears to be designed to support a faily large construction project, so it can be expected to see the construction of a good size new facility around the exisiting site in the near future. A new very large building is under construction just east of the Janet ramp. It measures approximately 255x184', and appears to be fairly tall. Nearby buildings include, counter-clockwise from the Janet ramp, the Janet Terminal, the New Base Headquarters, the PMEL Lab and the Main Security building. The building is large enough to be a new hangar, but based on the location near the new Base Headquarters it is more likely a new Dining Hall and/or administrative offices. The latest Google Earth imagery dated 6/28/2010 shows the previously vacant area being graded in preparation for the construction. 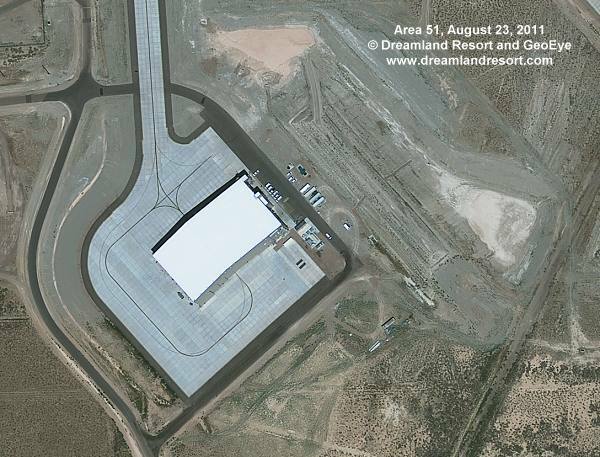 Another large hangar was added at the South Ramp between 11/05/09 and 05/24/10. 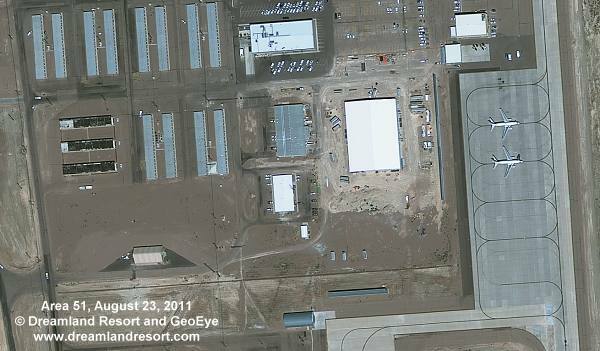 Ground preparation for the foundation can be seen in our June 29, 2009 Satellite Image. The hangar is located just west of the old Hangar 20-23 storage building. It is connected to the ramp on the south side, opposite another hangar that was added in early 2005. This page contains material (C) by GeoEye.